Robot Wars champions Apollo will be fighting it out live in Burgess Hill along with many of the stars of BBC2’s hit returning show at Robots Live. The popular event returns to the Triangle Leisure Centre on Saturday and Sunday, April 28-29, for the 12th year as part of its UK tour. Joining Apollo will be other famous faces from the new and old series of Robot Wars, including Eruption, Gabriel and Behemoth. They will all be battling to be crowned the Robots Live Champion. Joining the competitors in the arena will be the House Robots. Keeping control of the 110kg heavyweights will be Goliath. Weighing in at about 1,000kg and standing five feet tall, he is capable of rolling over a car with his powerful crushing arm and tracked drive. Alongside him will be BattleAxe. She weighs in at 130kg and looks after the 13.6kg featherweight robots. As well as the combat machines the show also features robot boxers. Standing nearly six feet tall, these mechanical monsters will go toe-to-toe in a pneumatically powered fist fight. During the shows viewers might also get a glimpse of some other famous TV and movie robots, with a Dalek almost certain to interrupt the event at some point. All of the action is housed safely in a purpose-built, 6,000kg arena, which is equipped with its own array of weapons including The Pit, a floor flipper and two hammers, which can be controlled by the audience. There will be three action-packed shows over the weekend. These are at 6pm on Saturday, April 28, and 12pm and 3.30pm on April 29. Tickets cost £14 for children, £16 for adults and £50 for a family (two adults, two children). 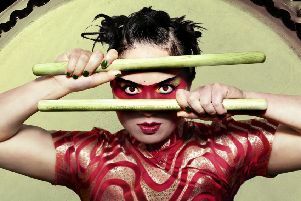 Visit www.robotslive.co.uk, call 0844 870 0000 or buy tickets in person from The Triangle.